In search of a building to interpret in watercolor, I ventured over to Midway Village. I walked the grounds and decided to take on the Breckenridge House. I embraced the challenge of the flowers. To interpret each planting. To instill unity and yet successfully elude to and instill depth to the scene. While I painted, a few of the volunteers worked tending to the flower beds. I opted not to include the workers in the scene. I was in a hurry and the many options for placement of the workers required more than I wanted to invest. Before I finished the painting, a couple of the gardeners came over to check out my work. One was put out that I did not include the whole house. Funny look on her face when I responded that I found the product of their efforts to be of more interest. Warm sunny day in November. Lots of color as not all of the leaves had dropped yet. Not many of these days available before it gets cold. Sometimes, you travel to an area anticipating a good, exciting scene to paint and end up disappointed. This was not one of those times. This stop gave me a better, livelier subject than I had anticipated. Made for a really fun morning of painting. I had not made arrangements to paint at Midway, but it was a good day to be out painting. I decided to go to paint at the Midway pond. I found this spot at the north side of the pond. The larger size (16″ x12″) took me longer to paint. Maybe too long. The shadows and colors changed a lot more than I needed. In the work, I lost the initial vision. I did not have my camera with me and my preliminary sketches were insufficient to help me hold to my initial inspiration. After working this for about 2-1/2 hours, I decided to pack up, head home and come back the next day. I did come back the next day. Found that I had to do a lot of work to get the painting back to where it should have been. A view of the 1800’s barn at Midway. 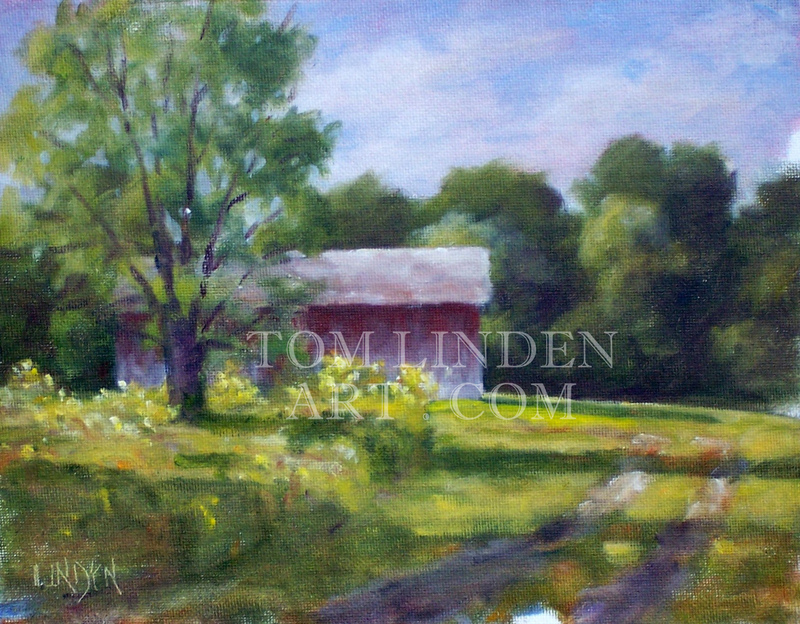 I took some artistic license with the barn. In reality, it is only weathered wood. No paint. To paint this as the bleached out building that it is, creates a design with a drab blotch in a critical spot (though some day I may figure out how to pull this off successfully). I decided to go with the stereotypical red barn, but weathered. I think that this worked better than painting it the way that it really is. Another day at Midway Village. 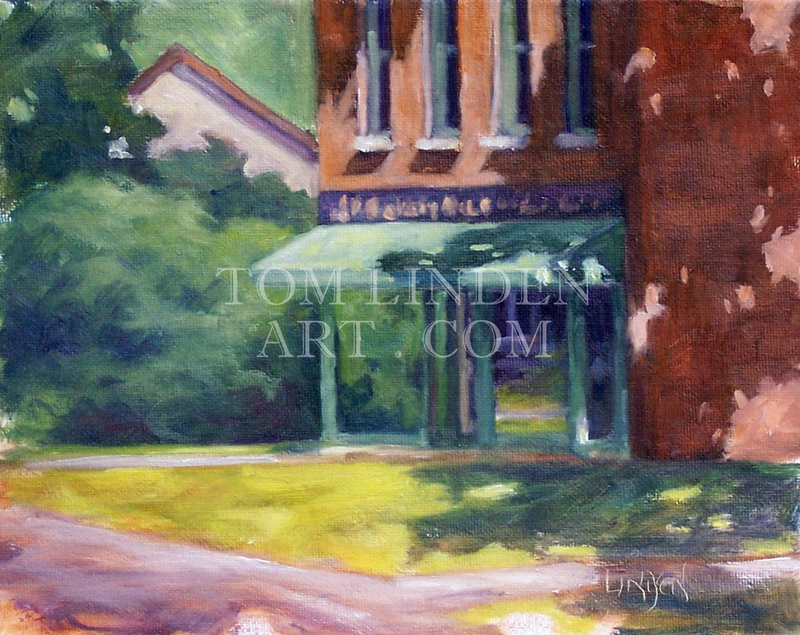 I decided to paint along Main Street. I was told that the Day Camp was in session. I thought that meant that the children would be playing games in the field to the east of me, well out of range. I was wrong. I had been at work on my painting for about thirty minutes when the day campers made their way into the village with their adult leader. Fortunately for me, I was stationed close to a large tree (for shade). It was a warm day and the leader decided that this was a good day to have the kids split into teams and play capture the flag in the village. Kind of fun. The kids ran all over the village. Occasionally a couple kids would run near me, but not too close. I didn’t feel so isolated. Fun day. The drawing went in fairly quickly, I tried to lock in the shadows as quickly as possible. All of the details of the architecture and the window reflections took a lot of time. Bigger challenge as handling the greens and ensuring that there were enough value changes to work properly . In reality, the values of the canopy and adjacent bushes were virtually the same. I had to use a little artist prerogative to make it work. A view of the 1850’s barn at Midway. The barn is gray. Really gray. I decided to utilize violet and Naples Yellow to get some zing into the barn. 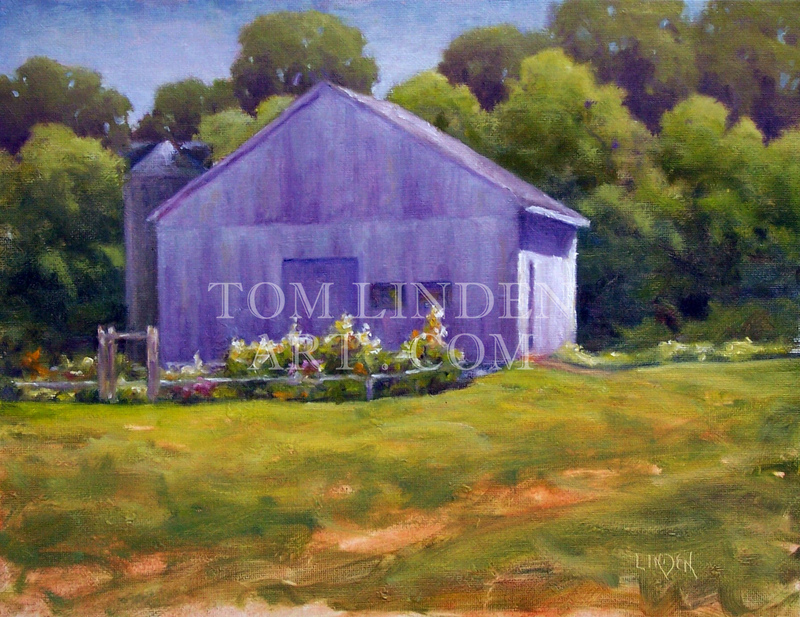 I also utilized Violet in the background trees which gave a feeling of atmospheric perspective and also added unity with the barn. 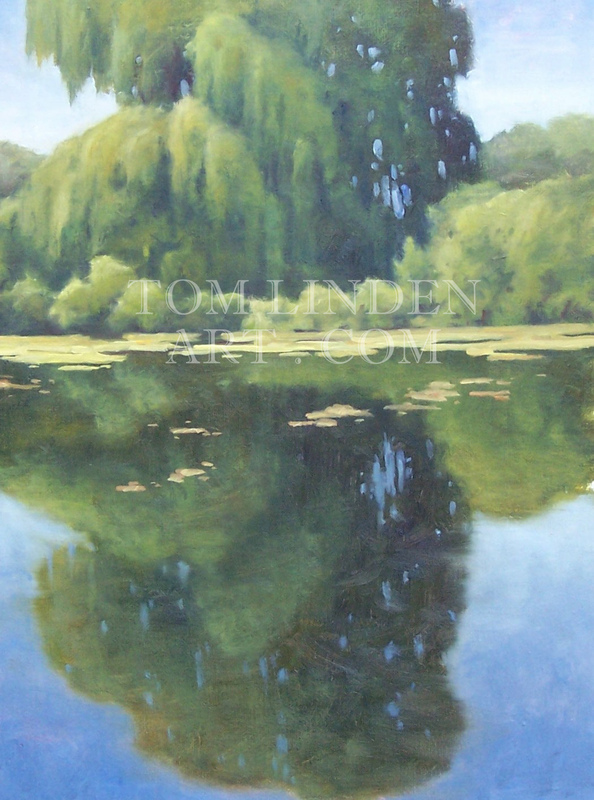 The foreground grass was started with a loose wash of Transparent Red Oxide. I then added body color to represent the grasses. There was no path from my view. I decided to add the path to give movement and to break up the grassy foreground. The ruts of the path are just the remains of the initial Red Oxide wash. No body color here.